Hi all.Being at the stage of announcement for 2.92.0 (Beta-1) release of Lohit Malayalam from lohit2 project & following the things we discussed earlier  we had tested the Lohit-Malayalm on Harfbuzz, utrrs, & on W8 as well. Here comes the screenshots for the same. Hi all. Its time to mention the status of work done for Lohit Bengali. One more thing that has to be updated to Below-base form substitution is, previously used ligature is different than what it has to be. Amongst these two in above screenshot, the rules has been written for the one on the left, but as per unicode specifications & MS typography specifications, it has to be the one on right. so it has been updated now . So that's it for bengali right now. the development is been tracked at lohit2/bengali . surely try to complete the other things asap. For any comments or issues github link is here . Hello all ! 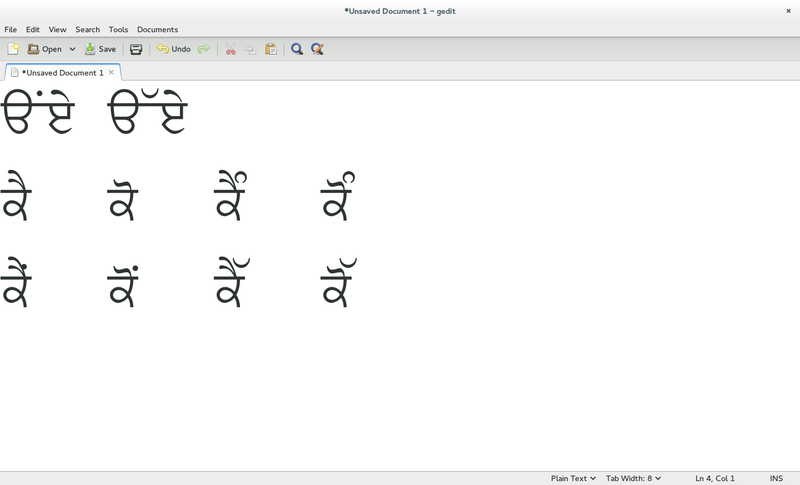 with the announcement for alpha release 2.91.0 of lohit-gurmukhi from lohit2 project, I would like to mention some improvements that we had achieved with this version over the previous one. The first improvement that's quiet notifiable is, of course, the task of renaming Lohit Punjabi to Lohit Gurmukhi since we had already discussed related to this . Supports guru and gur2 open type script tags. Open type gsub lookups reduction from 10 to 8. Corrected glyph class of all glyphs. "Copy Reference" feature implemented for better reusability of glyphs. Improved shape of aivowelguru, oovowelguru, aivowelguru_tippiguru, oovowelguru_tippiguru, aivowelguru_addakguru, oovowelguru_addakguru,oovowelguru_bindiguru. I would like to elaborate these designing improvements because we also had resolved the bug on bugzilla on this . So in conformance with that, the following screenshots are self-explanatory. The first section depicts designing in 2.5.3 version & second one is an improvement in 2.91.0. The basic need behind these design improvements helps to avoid merging & overlapping of some above base substitution glyphs to the consonant glyphs. This achieves better contextualization. 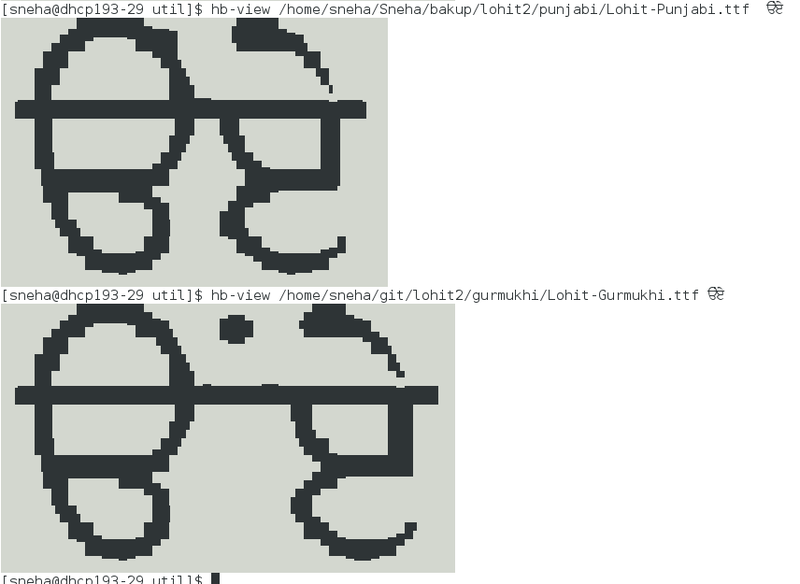 along with these improvements Lohit Gurmukhi had been sucessfully tested on harfbuzz, W8 & utrrs as well. Lohit page has been updated with this release. So at any point of time , if you came across any issue, please feel free to mention :) . Hey, good morning all !! Most of us might have attended this event called "GNUNIFY". as far as I know, It was 2 day event but was overwhelmed with lots of sessions which were truely truely helpful . As it was open to all, sessions were informative for all of students, professionals,developers etc. Unfortunately I had missed the first day sessions but I was there at second day on 15th Feb. There were a lot many sessions arranged on 2nd day as well among which I had attended the one which was "Django workshop". It was totally practical oriented session (really thankful for doing so) & session had included installation part as well, so that people got to know the details from basic stage.This session was well conducted by Arun Mittal. He differentiated the Django versions & their functionalities. He had briefly explained about settings.py, urls.py etc by means of programming. He made the audience to actually program & execute the things he explained. After this session we had served with delicious food :). well, succeeding session was "Using Git & Github", it was very much informative for beginners. The speaker had demonstrated the concepts of creating repo's, pulling requests, forking, ssh keys, committing, pushing, pulling etc. so, in-short the session arranged were truly informative (basically for learners). & I must say, they had done a great job. I am really thankful. Good morning everyone! With the release of Lohit Malayalam & script writings of automated testing tool, we are now looking towards improving Lohit Punjabi . 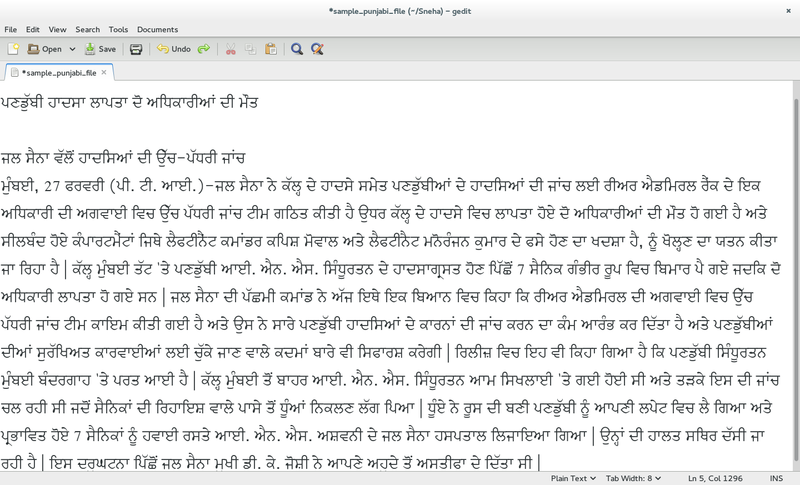 As previously specified in the mail on lohit-devel-list, its better to call "Lohit Punjabi" as "Lohit Gurmukhi". * Feature file separate for flexibility and reusability. * Supporting both "guru" and "gur2" open type specifications. * Removal of lookups which are no longer needed. Hello everyone. Being at completion stage, here comes the tool for automated testing which is key asset in testing process since it saves the time & predicts accurate output. Its just as simple as running a single command preceding with appropriate parameters . 1. We had written a script which takes the input involving script_name, test_file_name & ttf_file_name. 2. This script can be used for both generating the standard test case output from raw test case file & testing that standard test cases with the ones after newer modifications. 3. Only the thing to note is that, this script has hb-shape dependancy. So while executing this in fedora, ubuntu etc please make sure you have harbuzz-devel rpm installed . which will be going to include output for all the test cases specified in raw test file. this script can be executed, many a times , whenever any changes are been made. 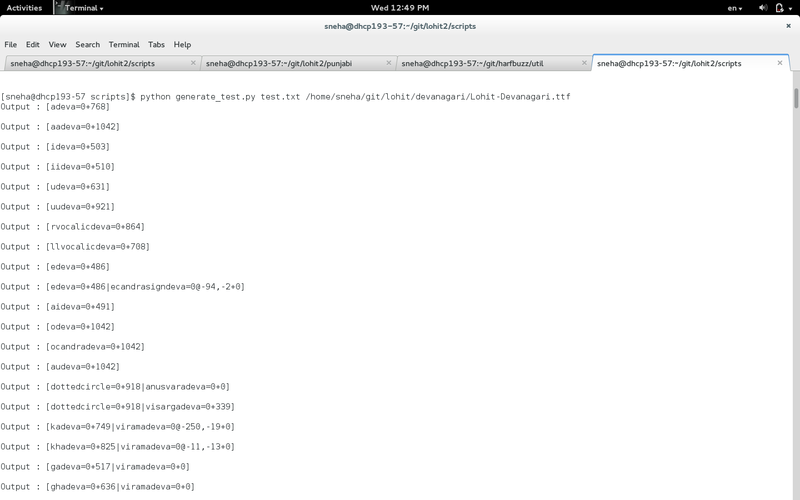 This script will compare output with the previously generated standard test file. > test_file : the name of text file wherein all your test cases resides. ttf file name for the font which you want to apply to. you can refer the link  for python script auto_test.py. Hope this finds useful. The Way We Proceed With Malayalam ..
Well, with the successful releases for Lohit Gujarati & Lohit Devanagari, we have planned to move towards Malayalam . Since the news has been already announced regarding the development plan for Malayalam language, this post is specifically about the minute details that we had considered while starting & developing towards the way. 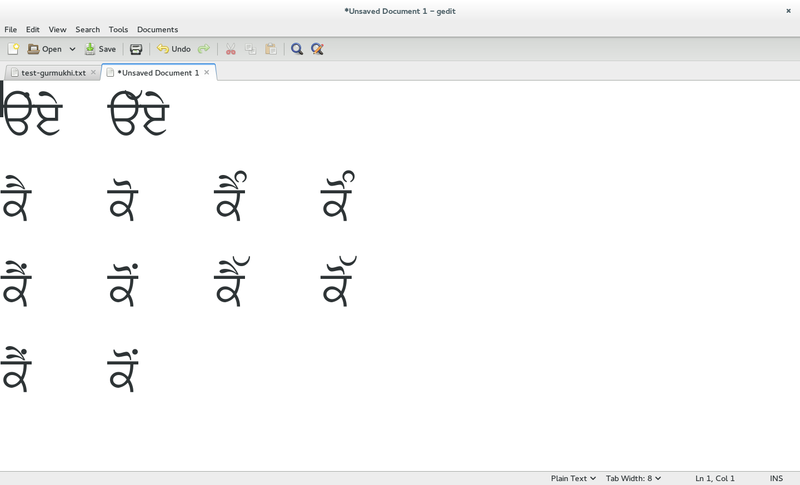 Supporting points provided in Unicode chapter 9 for Malayalam script. Feature file separate for flexibility and reusability. Supporting both "mlym" and "mlm2" open type specifications. Thorough testing with Harfbuzz and Uniscribe (WinXp, W7 and W8). Inspite of this basic goals ,I would like to depict the exact steps that we followed . >> The first task that we have started with Malayalam is to create test-file. This file is specifically for glyph-testing purpose & proper contextualization of glyph as well . >> The next thing We have moved to, is GSUB Cleanup so that we can start Malayalam development from very initial step while keeping an eye towards the basic moto. >> The Third task we have completed is about Glyph renaming. This step really helps for writing the GSUB rules, text rendering & glyph positioning sequence as well. For this task i would like to elaborate, as we had previously discussed & concluded , its better to follow AGL. yet fontforge restricts us for lengthy glyph namings , for such glyphs , we had excluded the AGL specification rules. >> After the Glyph-renaming task, We had gone through Malayalam Typography specification, & started For OT rule writing task. Presently We are done with basic shaping forms (except for cjct feature). To finish up with the remaining Features in regards to OT rule writing. you can have the updated project status & activities on Github  .so this the agenda that we had planned & following , thereby raising a step towards making the font more efficient, less redundant, & stable. Thanks.